Web Bluetooth is a standards initiative by the W3C Web Bluetooth Community Group. Originally designed to enable apps running in web browsers to communicate with BLE devices, the Web Bluetooth API is now also available for mobile apps built with Apache Cordova. During the last few weeks, we have been busy implementing support for Web Bluetooth and ECMAScript 6 in Evothings Studio 2.1.0, now available in a release for early testers. Bleat is included with the new example apps for ARM mbed (classic) and TI SensorTag that ships with Evothings Studio 2.1.0-alpha. ES6 is not yet widely supported on mobile devices. We have included the Babel compiler in Evothings Studio 2.1.0-alpha, which enables writing mobile apps in ES6. 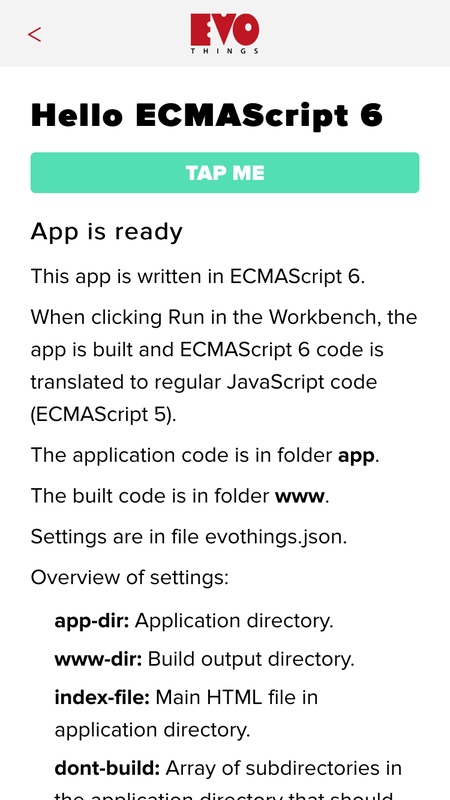 When you click the Run button in Evothings Workbench, ES6 source files are transparently translated to ES5, and your app launches as usual on connected mobile phones. Run the Hello ECMAScript 6 that comes with the Evothings Studio 2.1.0-alpha download to see ES6 in action. Visit the Evothings ECMAScript 6 documentation page to learn more. // device by service UUIDs). // Get LED write characteristic. // Start blinking the LED each second. Function requestDevice is the entry point in the Web Bluetooth API. It scans for devices that matches the filters you provide, and returns a matching device. It is possible to filter devices by name and by service UUID. Each function in the Web Bluetooth API returns a Promise, an object that will invoke a callback function when the promise is fulfilled (for example when a matching device is found, or a BLE service or characteristic is available). The function .then is used to specify the callback for a promise. Together with arrow functions in ES6, this makes for a clean syntax for code that is based on async functions and callbacks. In the original Web Bluetooth specification, requestDevice brings up a UI controlled by the browser, which displays a list of matching devices the user can select from. When selecting a device, the promise returned by requestDevice is resolved. With mobile apps developed using Apache Cordova, and in applications developed using node.js, the requirements are a bit different. It can be desirable to have control of the device selection UI, and to be able to scan for devices (such as Eddystone devices) and connect to them programmatically. Rob Moran has presented extensions to Web Bluetooth, to allow more flexibility for apps that are not running in a web browser context. These extensions are implemented in Bleat, included in Evothings Studio, and allows mobile apps to use requestDevice for tasks such as scanning for beacons and connect devices in a flexible way. Evothings Studio 2.1.0-alpha comes with two new example apps that uses Web Bluetooth and the Bleat library. 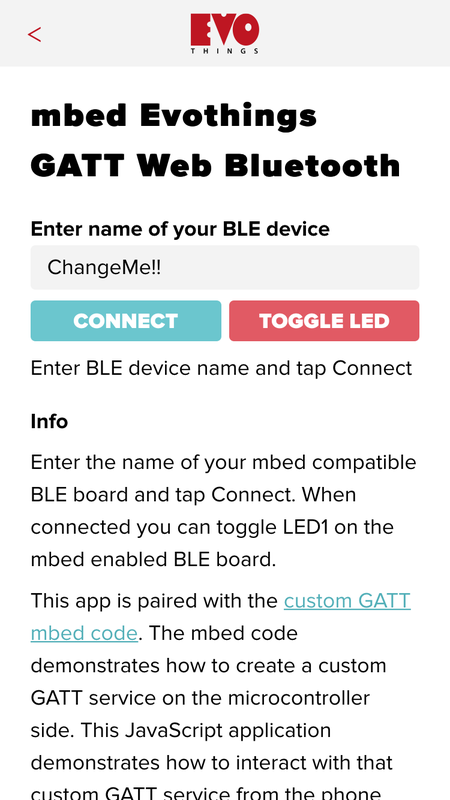 This is an app for ARM mbed devices, that turns on and off a LED on the device. The application code shows how to connect to a device and read and write characteristics using Web Bluetooth API. We have been using the Nordic Semiconductor nRF51 DK when developing and testing this app. This app listens for the TI SensorTag CC2541 accelerometer sensor, and displays sensor data continuously. The application code shows how to enable notifications using Web Bluetooth API. Download Evothings Studio 2.1.0-alpha and get started with mobile app development using Web Bluetooth. You will find the download under the alpha section on the Evothings download page.